Did you ever feel you are running out of time while you have a lot of ideas to boost your social media marketing? Today we will talk about how to lessen the process of Facebook marketing strategy in just two minutes. With over 100s of features and new Facebook algorithmic changes it’s hard to create a winning Facebook strategy. For a marketer, the key to get all your work done is to divide them into smaller do-able parts and accomplish them whenever you are free. James Clear has quite influenced me with his two-minute rule and it has helped me to clear out most of the items in my pending list. Here is how you can accomplish more Facebook marketing with just two minute work schedules. Your profile picture or gravatar is your brand. Make it such that people recognize your account through it. Your cover photo should speak volumes about your brand. Use it to showcase your accomplishments and authority. Always remember, the key to a winning Facebook marketing strategy is to be yourself on social media. Don’t imitate others in an attempt to get liked. Here is a full guide on different image dimensions on Facebook according to the latest changes. A BIO is often the most underrated yet the most prominent thing your new visitors see. Your potential fans get an idea of your business through your Facebook bio. So just update it with the latest credentials. Try to include your current placement and the correct educational details. This will not only help you show off your recent advancements but also will create a positive effect on your would-be friends. The apps on Facebook mean those Pinterest and Quora or Filpboard sections to the left column of your timeline. These are not just apps but are potential sources to convert your Facebook fans into your Pinterest fans or Flipboard followers and so on. This way you could leverage your Facebook fans and convert them to your fans on other social media platforms. Here is an easy and short video which shows you how to do this hassle free. A successful business can never stress enough on email lists. You should never miss a chance to convert your social fans to subscribers because converting someone who already is familiar to you is easier. The hard question that most brands face is how on earth they would convert a Facebook fan to an email subscriber. The answer is simple though. People love incentives and getting them right at their favorite hangout spot would make them click on your email boxes easily. Here are some of the apps that let you to use email lead generation boxes on Facebook. 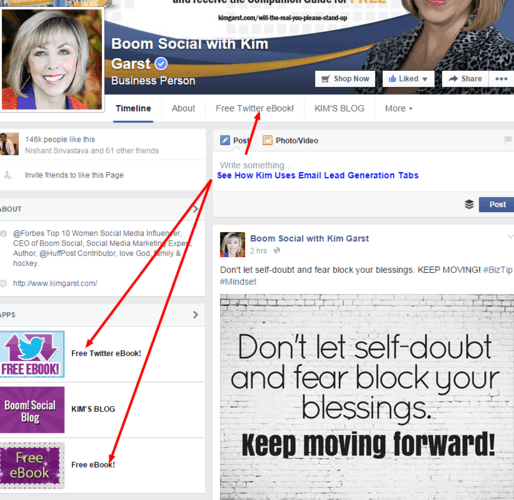 Here is how Kim Garst uses way too many freebies to generate email leads. If you want to market on any platform you need to know who your audience is. What are their demographics and so on? For this Facebook offers a rich insights and you should regularly study them. For example, my fans are most active in the evening that is 4PM to 12 am in the night. This means I must be scheduling even more content in this time frame to get good engagement on my Facebook posts. Pro Tip: Use a tool like SocialPilot to schedule social media posts easily. You can also use this to keep a close eye on the negative feedback. Just open up your page, choose insights and click on “posts” tab. In the section that provides you with the reach and performance of every page, click on the dropdown menu on the extreme right. Select the tab that reads, “Post hides, hides of all posts and report of spam”. This section shows your which of your posts were marked as spam or hidden from the news feed by your audience. You could also use quintly which provides clear cut and in-depth Facebook analytics. It has a free plan for small business and enterprises having up to three business pages. If you have more you could opt in for their premium service too. Have a product that you are selling? Did your company launch your new Facebook app? You can use Facebook’s call to action button to generate leads, get downloads and also direct fans to directly shop your products from your Facebook fan page. Only self-promotion might bore your fans away from you. So try to share related and relevant industry news from other experts. Sharing their content doesn’t mean they will rob you of your fans, instead you will get noticed by them and they will start sharing your posts to their fans. This will do benefit to both the parties ultimately as is stated by the 80/20 rule. Here you need to share 80 percent of the content of other influencers and fellow marketers (be careful to share only relevant and valuable info) and twenty percent that of yours. You can also use relationship marketing strategies to get more closer to your fans. In order to utilize Facebook marketing and convert your readers into fans and vice versa you need to integrate both the platforms so that your audience can easily switch between the two. If you are a WordPress user, here is a list of Facebook plugins for your blog (free). If you want rather more control and customization you can use my favorite easy social share buttons which offers dozens of more functionality. The best feature of Facebook is it lets you schedule content well in advance. This is especially beneficial when we have to cater to audiences that live in two different time zones. While Facebook has a feature to schedule content from within the platform, it is pretty basic and we there are pretty many apps available for scheduling your Facebook updates. I use Social Pilot for this purpose and it works pretty fast. Besides Facebook Hootsuite helps in scheduling and in fact managing most other social media platforms like twitter, LinkedIn and even Facebook pages. Sign up for your Social Pilot account here. Facebook previously gave targeting options on the paid ad service but now you can target your posts to specific fans that fulfill your given condition. This can be a great Facebook marketing strategy if used well. You could set your posts to reach people who live on a special location, or have a special interest or have liked a particular page on Facebook. This helps you target specific posts for specific audiences and not clutter everyone’s feed with every update. The posts irrespective of the targeting all appear on your page’s timeline though. Using this feature you are a local business, you could use this to promote a special event for your locality only. Or you can use it to target very micro categories of your audience to get even more conversions. For example, I write social media strategies as well as content marketing blog here. So If I update something related to Facebook I can easily set it to target a custom audience that likes Mari Smith or John Loomer’s page so that they are interested on the topic. Thus sparing the other small business owners (who are also my audience) from a update they aren’t interested in. 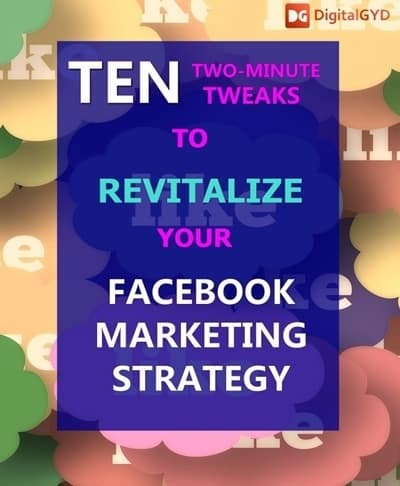 Well these were just a few tweaks to kickstart your Facebook marketing strategy. You would be surprised how much of your to-do list gets stroked off once you start this. What have you thought to complete today in the next two minute break? How to win customers by just being yourself. Here you have provided us best tips about facebook marketing. I have read this post through out and learn lot of things from your single post. A great post indeed! Thanks for this awesome post. Just I am going to follow some of your tips from this post to boost my facebook marketing. , Hope this will be helpful for me. Good post on Facebook Marketing! I agree with your points and I’ve learned something new today. Sharing other ‘s stuff is essential to market our brand. Yes, it would grab more eyeballs. I didn’t care about Facebook insights & analytics, but will avoid this mistake. Updating profile pic and the cover image is a good idea too. I know that you have immense knowledge in Social Media Marketing and I’m wondering with the sources which you’ve linked here. Will check them for sure. Thanks for crafting this nice post for us, keep writing. Have a great day ahead. I must say that this is a wonderful post and so full of information that I had to bookmark it for future reference. I have an observation that the sign up for MailChimp Facebook app seems to be pointed to Benchmark Facebook app link. Thanks for sharing. Take Care. This is indeed a wonderful and informative post. In fact as a newbie blogger, (I mean the WP plugins and technics) the tips mentioned here are really unknown to me. Thank you so much, some of the connected links are really worth visiting and I did it and obtained some very badly needed information, Thanks for those links too. Swadh, I am bookmarking this valuable piece for my further reference. Great post as usual. Thanks for sharing your great ideas with us. Facebook is a great way to drive traffic to your website and make your brand name. But it is only possible if you manage your facebook account in a proper way. And if you have no any idea about how to handle your facebook account, how to manage your facebook page, you can not get success in branding on facebook. As you mention, if you give even your 2 minuts on daily bases to your FB account, you can manage it very effectively, but you need to be more creative. The main thing in branding on Facebook, is your shared content. Your facebook fans always expect a quality and informative post from you, and if you not able to fulfil their expectation, your facebook marketing strategy is totally fail. So always try to provide quality through your post and share only informative posts that can attract your fans towards you. First off, amazing and yet informational post! I loved every bit of it! I haven’t been utilizing my Facebook page at all. Just few updates from here and there but not have planned out a strategy ever for it. But it is the time to do it! It is of course the best medium to get noticed by sharing others. With it and giving appropriate credit to the original sharer, we often get on foot of their audience and may get some chunk from them and land on our side. And integrating as much our blogs/websites as possible inside Facebook pages (with widgets, posts, etc.) is too helpful for to stream line the people liking our updates. As for the analytics, it is indeed the powerful system to detect what’s working and who’s making it to work. Thank you! Happy to share it!! It’s a great reminder to tweak our profiles and do them up well enough. Yes, managing your cover image, bio, and the app section can send a lot of new visitors your way. You are right about converting your fans to your subscribers by collecting their emails…still need to work on that. In fact it can be done on a lot of social networking sites, isn’t it? Sharing other people’s stuff is so essential, after all – being on the social media is all about others! I wish more people would understand this simple fact, which they don’t and tend to talk all about themselves, only to realize their mistake later. You are right about integrating your profile with others and having it well placed, especially the buttons on your blog as well, another thing most new bloggers forget.